U19 League. The 19th round. April 9, 2017. Schaslyve. Knyazha Arena. Att: 150. +11oC. The teams going side by side in the standings were meeting. 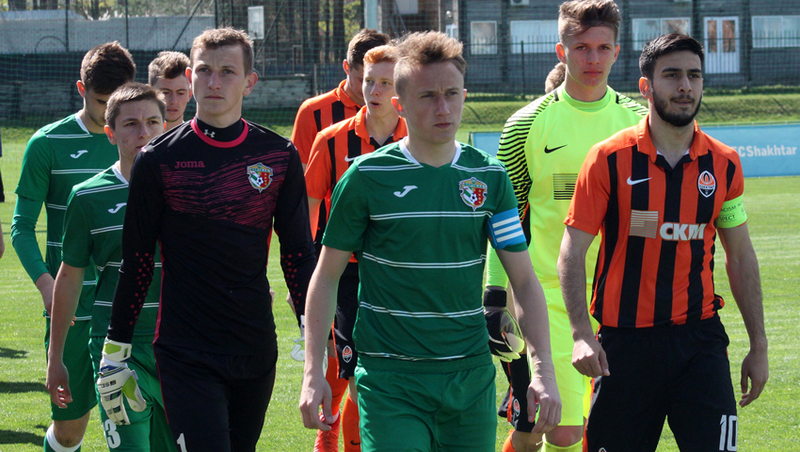 In the first spring round, Shakhtar (5th place, 31 points) confidently outplayed Zirka (3-1), while Vorskla (6th place, 30 points) lost away to Arsenal-Kyiv (1-2). In the Pitmen’s starting lineup, two U21 players appeared: Valerii Bondar as a central defender, and Dmytro Topalov on the left of midfield. Yet inside the 7th minute, the Orange-and-Blacks opened the scoring. Following a number of nice attacking moves, Maksym Chekh fired a long-range strike home to make it 1-0. The Donetsk side continued to be on the front foot, increasing the percentage of the ball possession. They actively employed the left flank, where Dmytro Topalov did not hesitate to take the initiative. He repeatedly outplayed several rivals at once, creating threatening moments near Vorskla goal. On 25 minutes, his another breakthrough ended with a low cross onto the goal box line, before Andrii Kulakov was the first to latch onto the ball. Shakhtar striker tapped the ball home with one-touch shot past the goalie to double the lead - 2-0. Regarding other efforts created throughout the first half, it is worth noting a set piece from Oleksii Kashchuk (near the cross bar) and Valerii Bondar‘ header (slightly over the bar) after playing a corner. The visitors slightly activated after conceding the second goal and launched two threatening counterattacks. Following one of them, the Pitmen’s shot-stopper Vladyslav Vertei was forced to make a save, as he contrived to deny an effort from nearly one-meter range. After the break, the game pattern did not change. The good quality turf, which withstood after yesterday's match between Shakhtar U21 team and Chornomorets U21 in the heavy rain, allowed the Orange-and-Blacks to deliver both rapid and set-play attacking moves. In early stages of the second half, Maksym Chekh mustered a clear-cut opportunity again by landing a pile driver to see the ball inches wide of the post. Into 55 minutes of the game, Serhii Shyschenko ‘s lads brought the score to devastating: after Andrii Kulakov was dumped to the turf against the rules inside the penalty area, Dmytro Topalov coolly dispatched a spot-kick - 3-0. The Donetsk side did not slow down and soon made their mark on the scoresheet again. Oleksii Kashchuk shot a well-placed curler into the far corner from outside the penalty area to make it 4-0. The substitutions made by both teams’ mentors destroyed the pace slightly, however the mode of the game did not change. Shakhtar kept on posing a threat with set play on the opponents’ half of the field, using flanks for attacks mostly. In the dying minutes of the match, Maksym Andriushchenko could put his name on the scoresheet. He played one-two with his teammate nicely inside the Poltava side’s penalty rea and struck to see the ball almost inside the net, but Vorskla goalkeeper made a last-gasp save to rescue the visitors. However, the Pitmen launched a model three-on-one counter-attack a bit later, before Vladyslav Kuzmenko beautifully flicked the ball into the far corner – 5-0. Toward the end of the meeting, a good chance came the same Andriushchenko’s way, but he failed to beat the keeper after a well-timed pass from Illia Putria. 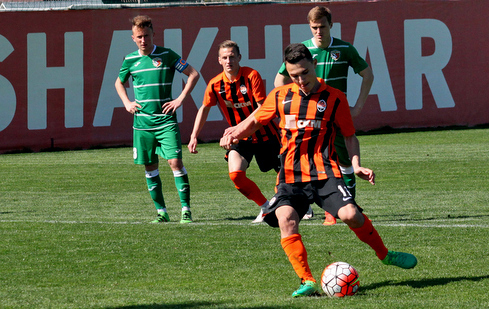 The referee’s final whistle recorded a confident victory by Shakhtar, who scored 8 goals in the opening two spring rounds. The Orange-and-Blacks are to hold their next match on April 22. 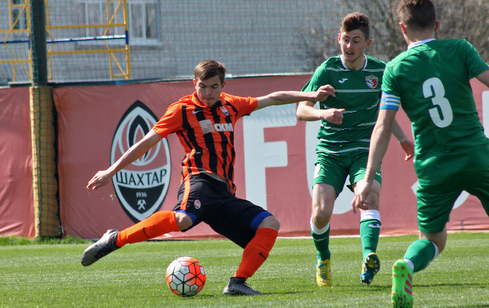 As part of the 21st round, the Donetsk side will lock horns with Oleksandriya away. In addition, the 20th round fixture Arsenal-Kyiv vs Shakhtar was rescheduled for April 26. - I am very pleased with the guys’ performance, as well as the result. Today, it has been a good game. Except two episodes at the end of the first half, when we failed and the opponents had clear-cut opportunities, Vorskla forged no more real chances near our goal. In general, we got ready for such operations from the Poltava side: with them demonstrating power football, maintaining constant pressure and high pressing. Therefore, I'm happy that we moved from defence correctly, especially in the second half, launched rapid counter-attacks and kept up creating moments of danger.